The Pacific Division-leading Calgary Flames are off to a strong start this season, led by an offence that is making waves around the National Hockey League. The Flames are the only team in the NHL to have four players at or above the 30-point mark. 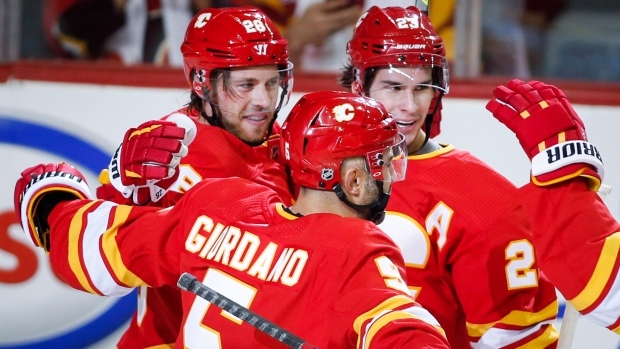 Johnny Gaudreau leads the way with 35 points (12 goals, 23 assists), Sean Monahan has 33 (17 goals, 16 assists), Matthew Tkachuk is third with 32 points (13, 19 points) and Elias Lindholm has 30 (13 goals, 17 assists). The Flames have also managed to score five or more goals in a period four times this season. The other 30 teams have combined to achieve that three times. “I think we have a lot of depth up front for sure, but the other thing is that when we get momentum, we’ve been able to make it count in a number of games,” team captain Mark Giordano said. The Flames are one of five teams with at least 100 goals for this season, joining Tampa Bay, Toronto, Colorado and Ottawa. This (28 games played) is the fastest the Flames have gotten to the century mark in 25 years. Tkachuk also believes the team’s scoring prowess comes from staying on the attack. “There are guys here who love scoring goals but I think it’s about momentum and riding that momentum wave as long as possible and ultimately trying to stay on the offence as long as possible,” he said.